Here is another post on the Bloomingdale neighborhood of the Upper West Side. It was written by Pam Tice, member of the Bloomingdale Neighborhood History Group’s Planning Committee. Bloomingdale’s residential development brought numerous retail food shops into the neighborhood, from the late 1880s to today, when the latest food store opening can still create excitement (see the frequent reporting on the new Trader Joe’s!). This post began as a search into our neighborhood food stores, focusing primarily on 86th to 110th Streets. This is a bit of an evasive topic, since most stores were small family-run businesses that did not advertise, and nor were publicly photographed. Moreover, the stores were part of a larger food retailing history from which individual stores developed, and how certain common products were created. Restaurants are another significant part of the neighborhood food story which were covered in an earlier post. Food history is a popular topic among historians now. A recently-published book, Feeding Gotham: The Political Economy and Geography of Food in New York 1790-1860, by Gergeley Baics gives a fascinating history on how “food provisioning” developed in New York City. This book details the changes in the city’s food distribution as it changed from restricted public marketplaces built by city government to privatized food distribution as a function of the marketplace. 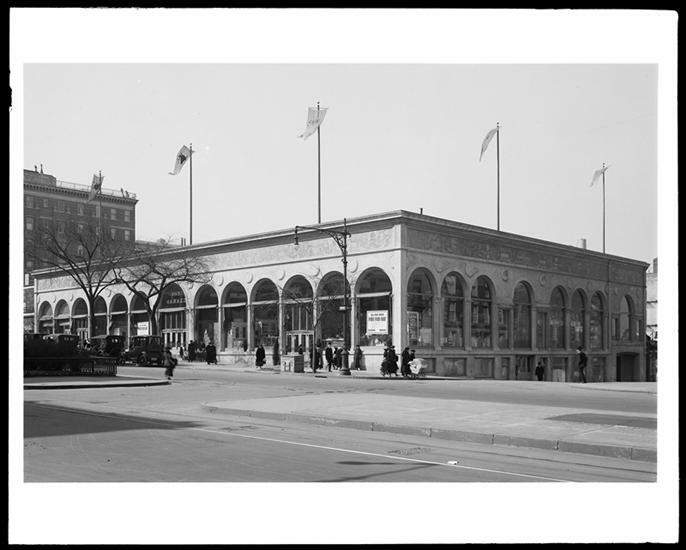 These food markets were once part of the city’s landscape: Fly Market (replaced by Fulton), Catharine Street, Essex, Jefferson in Greenwich Village, and the Washington Market, on the lower west side. 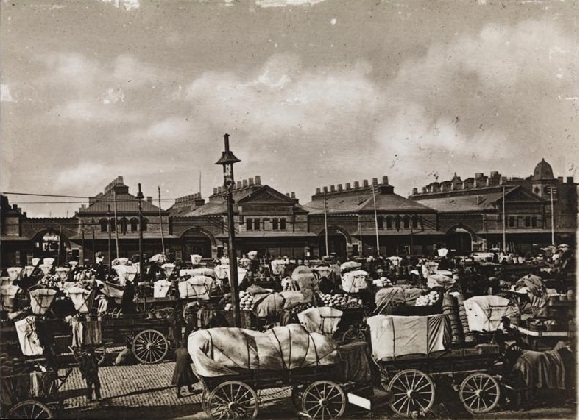 By the 1870s, the Gansevoort Farmer’s Market, near the Washington Market, was established: a vast stretch of wagons, as pictured below. Meat, poultry and dairy purveyors as well became the distribution center for the wholesale merchants who supplied the retail stores. This section of the city eventually gave way to Hunt’s Point in the 1960s, and what we now call Tribeca emerged as a new residential neighborhood. When Bloomingdale first developed, all the food retailers were private ventures, although one, Mr. Astor’s Market, was a marketplace concept, as described below. 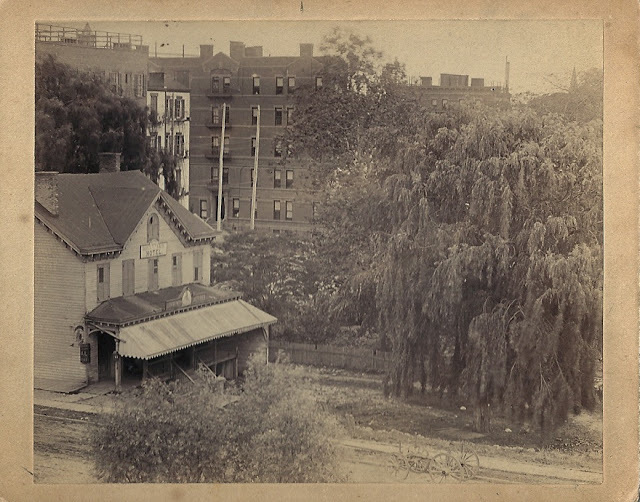 The Upper West Side transitioned in the 1870s from an area of rocky terrain with small dwellings, many with market gardens, to fully urbanized streets by the early 1900s. In 1879, the opening of the Ninth Avenue El generated increasing real estate sales. Later, in the early years of the 20th century, the construction of the IRT subway under Broadway would generate another building boom. Numerous social-welfare institutions moved to the area or were created there, touting the fresh air as a primary reason. Even a few left-over country mansions remained from the early days of the Bloomingdale Road that brought families to upper Manhattan away from the dirty air and disease-prone lower Manhattan. 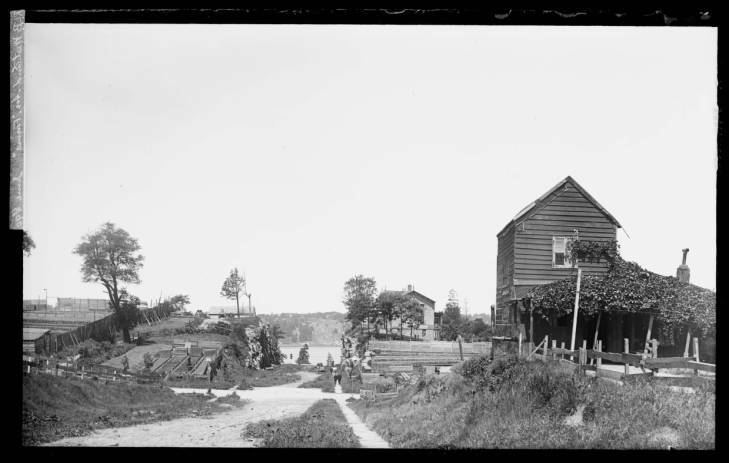 Here are a few of Mr. Bracklow’s photos taken in the late 1890s of the Bloomingdale neighborhood. A comparison of the 1880 Federal census to the 1900 census tells a story of Bloomingdale’s dramatic residential development. The census counts individuals in dwelling units, in family groups, so there are no notes on the existence of stores. However, the census taker sometimes makes a note on the neighborhood’s larger facilities housing many residents and also uses the column “occupation” to note a retail establishment. In 1880, there are just two Enumeration Districts, 527 and 528, for all of the Bloomingdale neighborhood, covering a portion of the 12th Ward, from 86th to 108th Streets. ED 527 has 179 dwellings housing 1194 inhabitants, and ED 528 has 218 dwellings with 1453 inhabitants. Mrs. Skinner appears as the Matron for the “Children’s Fold,” an orphanage at 93rd Street and the Boulevard, the earlier name for Broadway. She is caring for 65 children ages 6-10 years. There is a small hospital at Ninety-Ninth Street and Eighth Avenue. Mr. Hiram Downs is operating the Downs Hotel at the Boulevard and Tenth Avenue. Mr. Marshall, the second owner of the Clendening mansion, covered in an earlier post on the hill at 104th Street and Ninth Avenue, is listed. Elm Park and its hotel, also covered in an earlier post, is on another West Side hill. Many of the residents of these Enumeration Districts are immigrants from Germany, Ireland and elsewhere. How did these residents supply their homes and facilities? By the 1870s, milk was beginning to be bottled, and delivered by wagon; previously, the milk was in large cans, and scooped out into containers provided by the customer. It would be a while longer before pasteurization was established. In the 1850s, New Yorkers had come to realize that the milk from one or two cows established near a brewery and fed the discarded mash were producing swill milk that was making many children sick. The Dairy in Central Park was established to make this point: that cows producing fresh milk should be the healthier norm. As the city grew, dairy farms developed north of the city, supplying dealers by either boat or train down to the city to the lower West Side where the wagons were loaded. By 1903, two major dairies were located just to the north of Bloomingdale, on 125th and 130th Streets, far to the west, near the railroad. The milk trains supplied them, and milk was then pasteurized, bottled and sent out for delivery in wagons to drop thousands of bottles around our neighborhood. Numerous other items were delivered by wagon until stores were established: butchers delivered meat, fruit and vegetable dealers loaded up at Washington Market and moved through the neighborhood, and ice and coal were brought in. Perhaps those with market gardens in the neighborhood sold their fresh produce directly or by pushcart. There is no Business Directory for the 1880s nor does the Robinson Atlas, online at the New York Public Library, note the existence of stores on the ground floor of the clusters of “flats” beginning to fill in the streets and avenues of Bloomingdale. The 1880 census column noting occupation sometime notes “retail bakery” rather than “baker” for a man, giving a clue that a store exists. Most were small operations; it wasn’t until chain stores developed that we can find newspaper ads, some with location addresses. We have to assume that basic needs are being met with local retail and wagon-deliveries, with other shopping venues reachable downtown on the El or the streetcars. The Ladies Mile shopping district was another source of groceries, although too far for daily shopping when refrigeration was still limited. Two of the largest stores there, Siegel Cooper and O’Neill-Adams had fully-stocked grocery stores along with their dresses, corsets, hats and other clothing. The regular grocers of New York City made an attempt to put a stop to the selling of groceries in these “department stores” but were not successful. In addition to the oddity of selling groceries under the same roof as clothing, the Siegel-Cooper store also had a bank, barbershop, jeweler, drugstore, telegraph and post offices, a doctor’s office, manicure and hairdresser, a restaurant and a tearoom, a wine shop, hardware, pets, and, on occasion, exotic shows and lectures. By the time of the 1900 Federal census, a massive population increase had taken place in Bloomingdale. Just 97th to 108th Streets had twelve or more Enumeration Districts. One ED, covering Central Park West to Columbus, from 97th to 98th Streets, has 72 dwellings with 1269 individuals living there. There is a Trow Business Directory available for 1900, with the businesses arranged by type, as the Yellow Pages does today. The Directory lists many retail stores, especially along Amsterdam and Columbus. Many of the buildings along Broadway were just being constructed in the early years of the 20th Century as the IRT sparked development; stores were developed later there. Bakers were numerous in the business directory; there are five on Amsterdam with street numbers 500-900 which covers the Bloomingdale neighborhood. George Barthold had his bakery at 968 Amsterdam. He immigrated from Germany in 1873, and lived with his wife, Augusta, two sons 18 and 20 years old who are also bakers, yet another baker named Otto living there too, along with other staff, Bertha the bookkeeper, Marta, the store tender, and Annie from Ireland, helping with the housework. With a neighborhood of so many German immigrants, delicatessens were popular; there are eight on Amsterdam and six on Columbus in the area north of 86th Street, counted in a perual of the business directory. Numerous fruit dealers, retail butchers, and stores selling butter, eggs and cheese are there too. There are many other types of business too, to be covered in a later post: bootblackers, dressmakers, and numerous coal and ice dealers. One delicatessen in our neighborhood, Richard Hellmann’s store at Columbus and 84th Street, operating after 1905, became famous much later as his wife Nina’s mayonnaise was served from a blue-ribboned jar on the counter. By 1916, Hellmann figured out how to stabilize his product and pack it in jars. He incorporated his company in Long Island City, delivering his mayonnaise by truck around the city, and eventually around the country. Check your Hellmann’s jar today: the blue ribbon is still there. In his book of postcard images, The Upper West Side, Michael Susi captures the Park & Tilford store at Broadway and 101st Street, on the street level of the Chepstow apartment building. The Chepstow is one of several on the Upper West Side designed by architects Mulliken and Moeller who are known for their brick and terra cotta work; they also designed Bretton Hall at 86th Street and Broadway. Park & Tilford was established in the mid-nineteenth century by two ambitious young men, John Tilford and Joseph Park, who were both grocery store clerks in downtown Manhattan. The establishment of their stores followed the development of residential Manhattan, and, by 1900, they were on Sixth Avenue at Ninth Street, two locations on downtown Broadway, on Fifth Avenue at 59th Street at the South East corner, and on the Upper West Side first at Columbus Avenue at 72 Street, and then in their Bloomingdale location. Their elegant Columbus Avenue building still stands, now a residential building. There’s no record found as to how long they were at the Chepstow but their presence, a grocery store catering to “the carriage trade” shows how the neighborhood was developing. 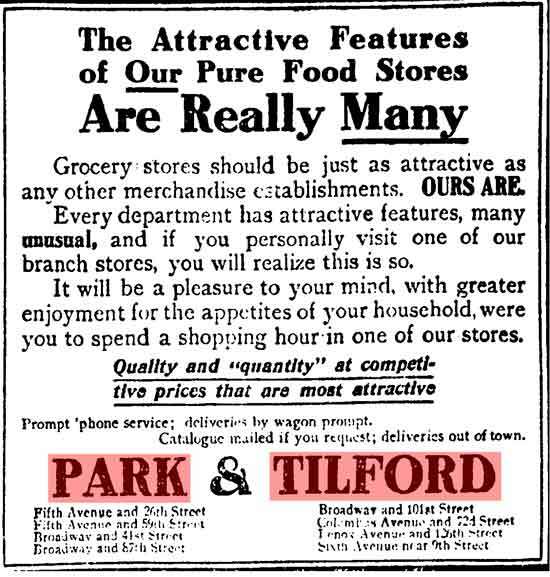 Park & Tilford provided “first class groceries.” Besides many imported gourmet foods, they sold wines, confectionaries, cigars and personal items. This advertisement from 1911 describes their wine selection (and lists the Bloomingdale location). Mr. Park and Mr. Tilford played a role in the development of the product still around today: Philadelphia Cream Cheese. The grocers worked with William Lawrence, a farmer and cheesemaker, to make a Neufchatel cheese; he added cream to the curds, labeling it “cream cheese” and went on to mechanize its production, eventually forming a new company. Cream cheese made in Philadelphia was already known, thus the name of the company, which wrapped its products in rolls in a foil wrapper and shipped it down to the city. There were many other retail “grocery chains” that developed before 1900 and into the first years of the 20th Century. The Great Atlantic and Pacific Tea Store, founded in a shop at 31 Vesey Street in downtown Manhattan, is perhaps the most famous and historical of all the retail grocers, lasting until the economic downturn of 2008. In 1914, there were over 800 stores across the United States, New York City included. Unfortunately, their daily newspaper ads do not list locations but suggest that there were many choices. One source notes that A&P established ”Economy Stores,” smaller shops located in many neighborhoods. Early grocery stores were nothing like our supermarkets of today. Customers came into the store and waited their turn at the counter where assistants fetched what was required. Items did not come in consumer-sized packaging; the assistant had to weigh and measure precise amounts. 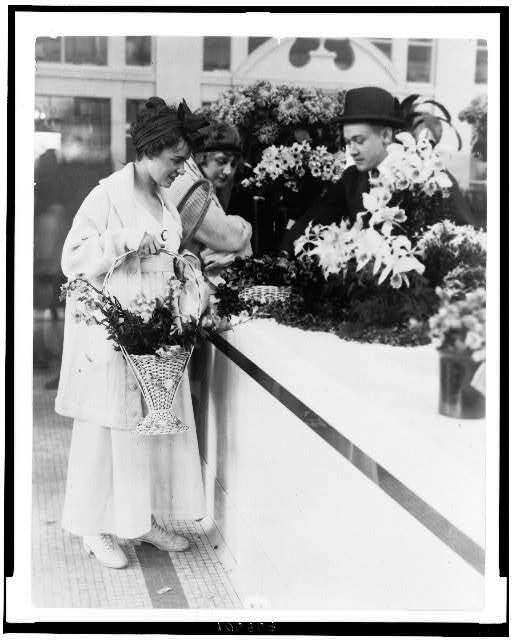 Shopping became a social occasion with customers and store staff engaged on conversation while their orders were collected. This labor-intense system led to the change that was initiated at a Piggley Wiggley store in Memphis in 1916, the first self-serve market where customers walked around and chose their items and brought them to a “checkout” in a wooden basket. Gristede Brothers started at 42nd Street and Second Avenue in 1888; they had five stores by 1903 and 45 locations by 1914. 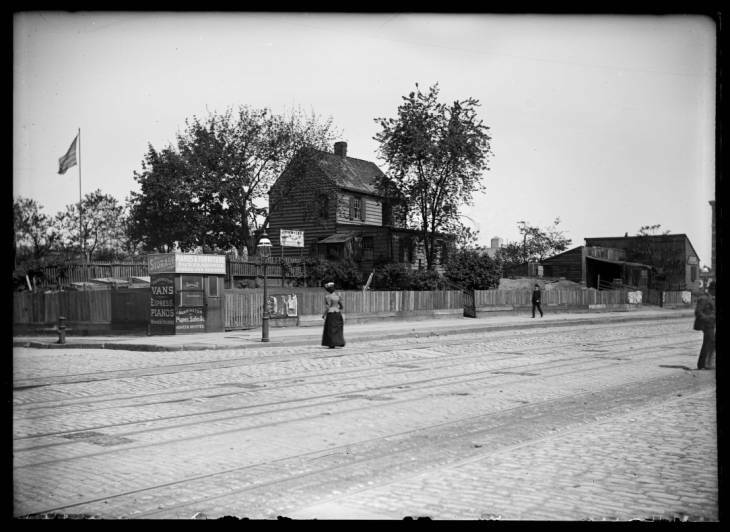 There may have been a store on the SW corner of Amsterdam and 109th Street, as a real estate sale is noted there in 1910. In a news report about a water main break on Broadway, there is a Gristede store mentioned at 89th Street. Another chain, A. F. Beckman & Company is listed in the 1900 Trow Directory at 908 Columbus Avenue, and eight other locations. They grew to 25 locations in 1914. Andrew Davey owned 19 grocery stores according to an 1898 Trow Directory; there was one at 736 Amsterdam Avenue, and two others at 754 and 781 Columbus Avenue. 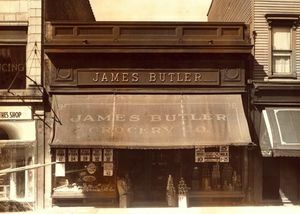 James Butler owned 43 stores by 1914; in 1898 he had three on Columbus at 620, 702, and 754, and one at 774 Amsterdam. 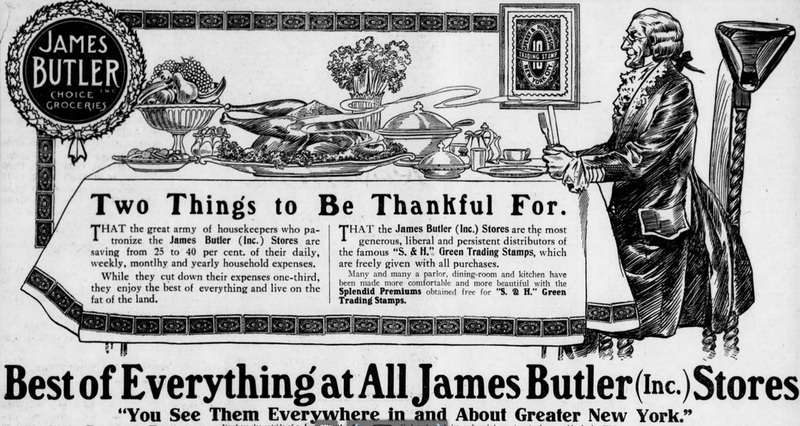 In the early 1880s, Mr. Butler had invested his $2000 life savings in a grocery store on Second Avenue in Manhattan. The number of stores grew; when Butler died, he was worth $30 million, and had more than 1,100 stores, second only to the A & P. He too considered his shops as catering to “the carriage trade”; his locations on Columbus and Amsterdam were meant to serve the families living on Central Park West and west of Broadway. Mr. Butler owned an estate in Tarrytown, New York, and was neighborly with the Rockefellers. He was also a prominent owner of racehorses, and built the Empire City Racetrack in Yonkers. He made home deliveries from his stores, and when his delivery horses became old, they left the streets to retire to his estate. He established Marymount College in memory of his wife. He made many gifts to the Catholic Church over the years, so many that the Pope awarded him a Knight Commander of the Order of Saint Gregory. Throughout his life, even as his fortune grew, he called himself “the Egg and Butter Man.” His son James Butler Jr. was more interested in horse racing than grocery stores, and as the Depression played out in the 1930s, the company sought “reorganization” and then bankruptcy. One lone store was still operating in 1940 in Queens. In October 1940, Butler Jr. died after being thrown from a horse. Mr. Butler’s store pictured here was in Astoria, Queens, but all of the establishments were branded in green and gold exteriors. While there were many chain stores, most of the grocers were still independently single store operations. For instance, we find John B. Accietto, an Italian immigrant, with a store at 767 Columbus Avenue. In the 1900 Trow Directory he is listed as a grocer; in the 1900 census, he is listed as a fruit dealer. He is a widower with children, all girls, aged 20, 16 and 14. His 20-year-old daughter has married, and she and her husband, John Persilo, and child, live at 767 Columbus also. This example of a family business appears to be the norm for food purveyors in Bloomingdale. The market, in what the newspapers called “a high class apartment district” had clean white tile floors, and white Carrera glass counters.” Meat and poultry was in plate glass cases cooled by frosted coils first cooled by ice machines in the basement. The store had an incinerator that burned all waste and garbage. There was a plan to open a lunchroom in the complex, but no evidence that it happened. However, even with Astor’s subsidy, the market did not last. One resident is quoted in a New York Times article, saying that the new market “was not worth the time and carfare” and she would continue shopping at the stores closer to her home. Thomas Healy, a successful restaurant owner, bought the site, transformed the market into a restaurant called the Sunken Garden and an indoor skating rink which later became the Symphony Theater, and today, Symphony Space. After he acquired an additional lot south of his facility on West 94th Street, he built Pomander Walk. Another source, the 1912 real estate map of our neighborhood, notes a few of the businesses in certain buildings, confirming the pattern of small shops in the buildings now covering most of the Bloomingdale area. On the east side of Amsterdam Avenue between 98th and 99th Streets, there is a bakery and a carpet store; between 97th and 98th a Chinese laundry and a drugstore on the corner of 98th. Columbus has the same pattern: a bakery, a confectionary store, and a drugstore on the North West corner of 96th. Confectionary stores were a regular features of the neighborhood. Many also sold ice cream, although that treat was also available from wagons, as it is from trucks today. 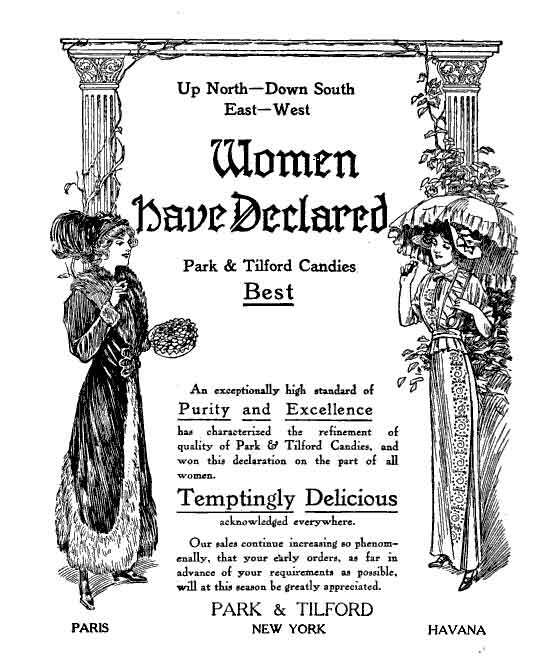 Sweet shops were often run by women who began by making candy at home and then opening small shops, as these did not require much equipment or capital. Of course ice cream was also a feature of the drug stores, another type of shop to be covered in a future post. 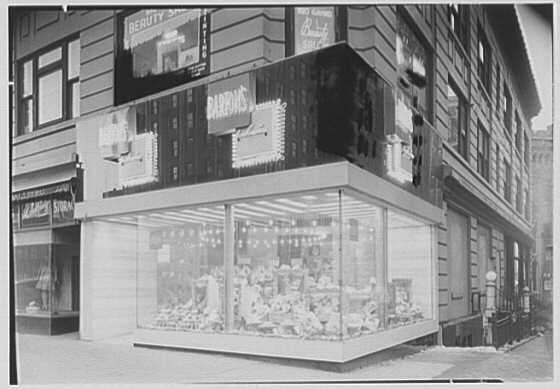 By the 1930s, chain candy shops were developing: Barton’s, Barracini’s, Huyler’s, and Loft’s. In the 1940 telephone directory, a Barracini is listed at 2345 Broadway, and a Barton’s, was located near our neighborhood, at Broadway and 81st Street. A man raised in our neighborhood also remembers one between 96th and 97th on Broadway, probably located there to also serve the patrons of the nearby movie theaters. 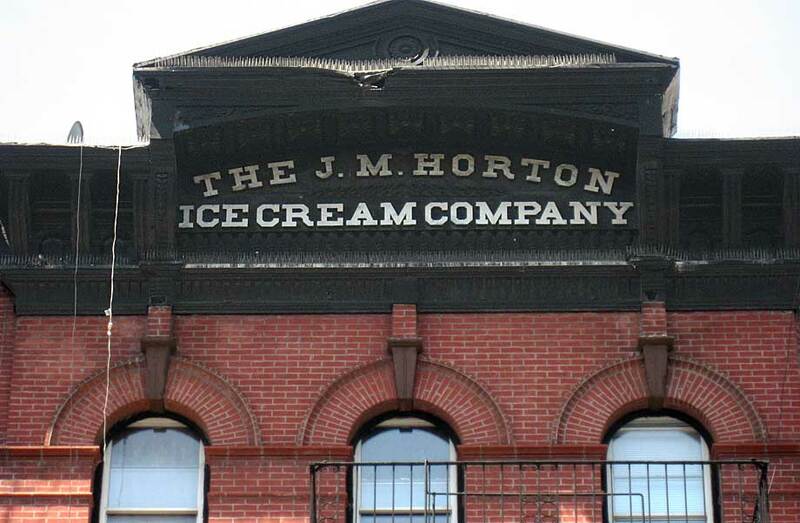 One of New York’s most famous ice cream makers, James M. Horton, started out in the milk-producing business in Orange County, and then moved into ice cream production. 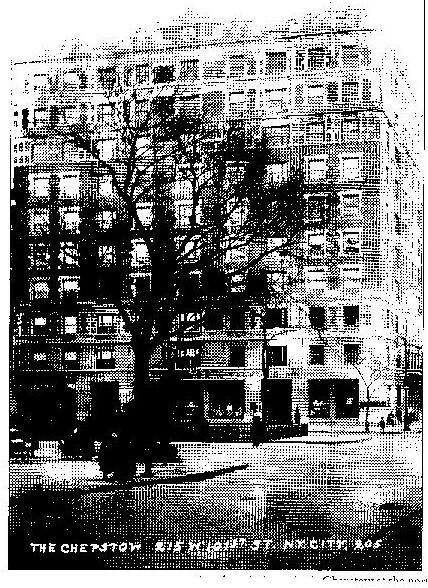 One of his facilities, at 302 Columbus Avenue, at 74th Street, lasted until 1922. The building provides the memory of this company, whose ice cream was served at White House events and glamorous ocean liners. Thanks to the New-York Historical Society, there is a readable copy of the 1922-23 Trow’s Directory available in digital format. However, there is no business directory in “yellow pages” format. Finding food purveyors in the Bloomingdale area is difficult, as the directory is now a multi-columned, thick book, more like our phone directories of today. The A&P stores which were undoubtedly here are not listed, nor are the other chains named above. Using the name “Academy” and “Riverside,” the area’s telephone exchanges, turned up a few shops, an Academy Delicatessen at 2746 Broadway, a Riverside Lunch Shop at 2566 Broadway, and an Astor Court Fruiterer at 2436 Broadway. The 1940 telephone directory, online at the New York Public Library, does not have a yellow pages, but numerous Bloomingdale businesses are listed. There is just one Acker Merrall & Condit grocery store, at 2377 Broadway. Gristede’s has seven stores on Amsterdam between 77th and 115th Streets; seven on Columbus, with two at 93rd and 104th Streets, and eleven on Broadway from 75th to 111th Streets, with stores at 99th, 103rd, 108th in our neighborhod. There is a Winkelmann Brothers grocery store at 2388 Broadway, next door to Reyman’s French Pastry Bakers at 2387. The A&P stores are listed by their store number in the directory: there are A&Ps at 724 and 768 Amsterdam, 2507, 2732, 2827 and 2886 Broadway, and 727 and 908 Columbus, with nine stores along Columbus in total. 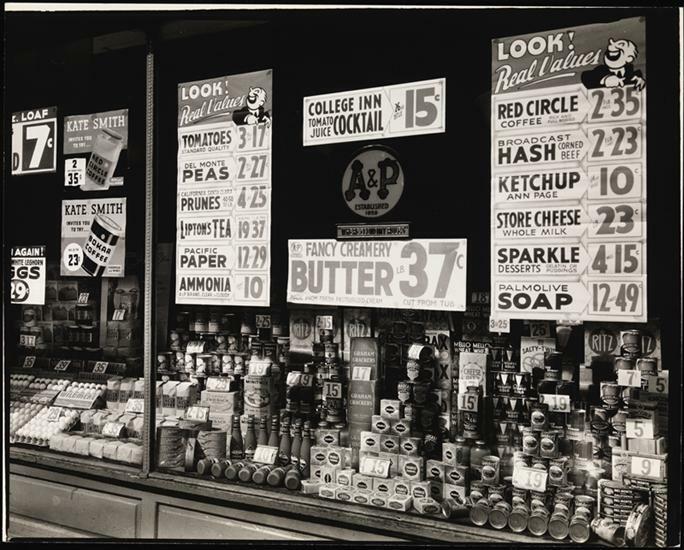 This Berenice Abbott photo from the mid-1930s, while taken on the East side, serves as an example of a grocery store window during this period. Another source for finding local stores is a 1940 Yearbook from Joan of Arc High School on West 93rd between Columbus and Amsterdam (now a junior high). Many local retailers took small ads in the back of the book. On Amsterdam Avenue we find Hunters Food Market at 951, Kimker’s Delicatessan at 712, and H. Rudnick at 93rd. On Columbus Avenue, Tony River’s Fancy Fruits and Vegetables is at the corner of 97th Street, Gramercy Market between 96th and 97th Streets, Pfeiffer’s Market with high grade meats and produce at 731, Joseph Schmid offering meats, poultry and fish at 725, and Ralph’s “quality fruits and vegetables” at 711 Columbus. On Broadway, the New Riverside Market with meats, poultry and game, at 2749 Broadway between 105 and 106, Rosmar Butchers at 2603 Broadway between 98th and 99th Streets, and the New American Food Center at 2551, on the southwest corner of 96th Street. The Gristede Brothers placed a general ad representing all their Bloomingdale stores. 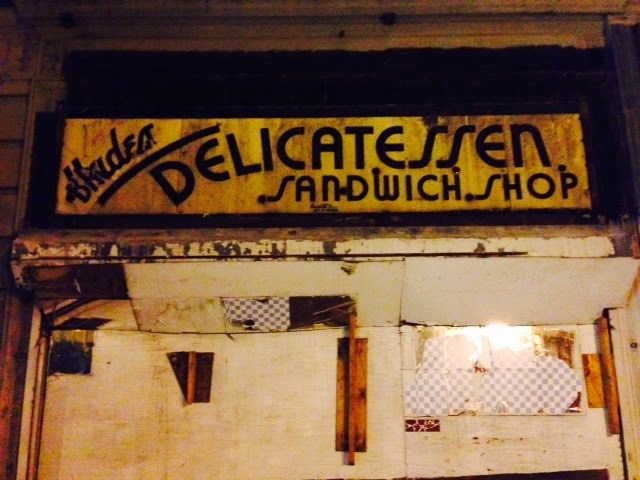 Caitlin Hawke, who covers many neighborhood historic spots in her marvelous blog for the 102-103 Block Association, helped identify this old sign from the Hudes Delicatessan, at the northwest corner of Broadway and 103 Street. The sign re-appeared recently when the storefront was under reconstruction. Caitlin quoted Manhattan Mark who comments on the West Side Rag and reports that the Hudes family started their business in the 1930s and lasted into the 1950s. In the 1940 telephone directory, this was B. Hudes & Sons, 2703 Broadway, AC (Academy) 2 4116. Caitlin’s work also uncovered a Hanscom’s Bakery at Broadway and 103 Street; in the 1940 Phone Directory, there are also Hanscom’s Bakeries on Broadway at 79, 93, 97, and 112 Streets. 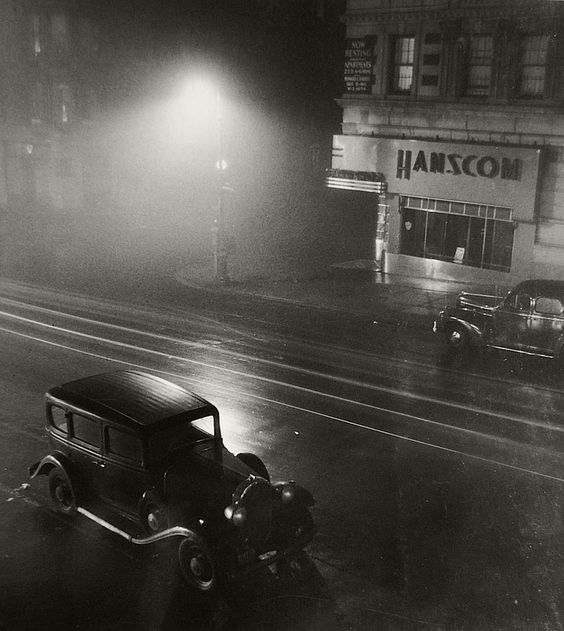 This Albok photo of a foggy New York Street in the 1930s uses a Hanscom Bakery to set the mood. 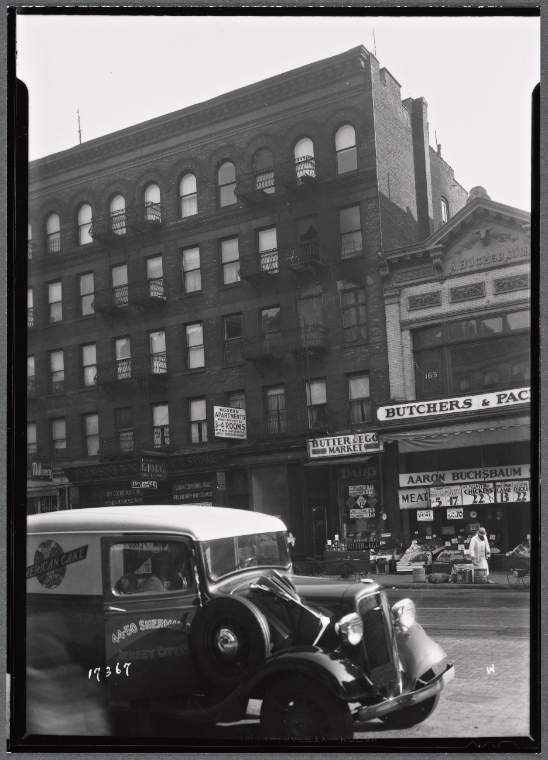 The New York Public Library has a file of “Tenements and Storefronts” in their digital photo collection, but there is only one photo taken on the Upper West Side, of a butcher shop (with a butter and egg store next door and a delivery truck in the foreground) on Amsterdam Avenue between 67th and 68th Streets. Here it is, as a representative of the 1930s era. As this piece was being written, the 1940s New York City Tax Photos were offline. When they reappear, later this year (2018), there may be another batch of neighborhood photos to add to our work. Library of Congress Chronicling America newspapers database.